Faced with a day off work in order to catch up with paperwork and gardening, what did I do? Make cake, of course. Procrastination is such fun. A mug of tea and a slice of cake is one of the great rewards after a good potter round the plot and as the veg patch is at least offering up soft fruits at the moment, this recently discovered cake sprang to mind today. I haven't done a recipe on the blog for a long time but, I hope you'll agree, this one is worth sharing, especially as the summer may be on its way finally and tea in the garden can take its rightful place once more. I found this cake via Pinterest; it's originally baked with just blueberries and called Buttermilk Blueberry Breakfast Cake. While my renaming of the adapted cake is not so alliterative, it tells it like it is. This is a cake that celebrates the soft fruit harvest of the summer kitchen garden. I used mostly blueberries, topped up with raspberries, strawberries (and, this time, sweet cherries); with lemon zest, vanilla and buttermilk, it's full of subtle flavours - I also used some of my lavender sugar* for the top crust. Baked in a square tin, it looks like a traybake; the crisp sugar crusted top yields to a light, moist crumb with bursts of soft fruit. Because I've now made it twice, I know that it's also heavenly warmed through and served with cream or custard as a pudding. The original recipe came from this American blog; I've reworked it to grams rather than cups. Interestingly, I first made it to be shared with someone who is dairy intolerant so it was made with dairy free sunflower spread to replace the butter and soya milk instead of buttermilk. It worked perfectly. 1. Preheat oven to 350F or 180C. Cream butter, lemon zest and sugar until light and fluffy. 2. Add the egg and vanilla. Beat well. 3. Take out a couple of spoonfuls of the flour and gently toss the soft fruit in this. 4. Mix the remaining flour, baking powder and salt together; Add to the batter a little at a time, alternating with the buttermilk. 5. Fold in the blueberries/strawberries/other fruit. 7. Allow to cool in the pan for 10 minutes before lifting the cake out onto a cooling rack. * Lavender sugar is a lovely thing to have for use in the kitchen, it gives a subtle flavour to cakes, biscuits, etc. Karen at Lavender and Lovage has a nice easy post on how to make your own. I. guess. you'd. say... what can make me feel this way? After the gloom of the slug post, I thought sharing a bit of mid-week cheer was in order (even though, for now, it's still raining here in London). Two whole days of dryness in one week would be reason enough to celebrate this summer; yesterday was one of those days - albeit pretty overcast - and, on Sunday, we actually saw some blue skies in London. Yesterday evening after work, determined that summer will happen eventually, I took a stroll down to the veg patch to plan what needed to be done next. Everything looked as it did when I left it on Sunday, perhaps the purple podded were a little plumper but the courgettes were no bigger, the climbing beans no taller. Then - whoop-di-doo! - I spotted that the first of my sunflowers had flowered! Obviously the Sunday sunshine had worked it's magic. Such a simple thing, but it definitely cheered me up. I dashed home to get my camera and had to stand on two wobbly bricks and hold it up high, at arm's length, in the gathering dusk, to get this photo. I confess I have used Photoshop to deepen the colours very slightly in the top photo to bring out the warmth of the petals. I could almost believe the sun was shining! According to online forecasts, the jetstream is moving north this weekend and, in the south at least, we will be basking in, err, 66 degrees Fahrenheit (19 celsius). That'll do me. Cos that's the seed I sow. I have the copper trowel, I have the raised beds. I fondly imagined that, in the veg patch, this would minimise the impact of the plague of slugs being visited on the rest of the nation's gardeners. Not so, as this recent discovery bears witness. 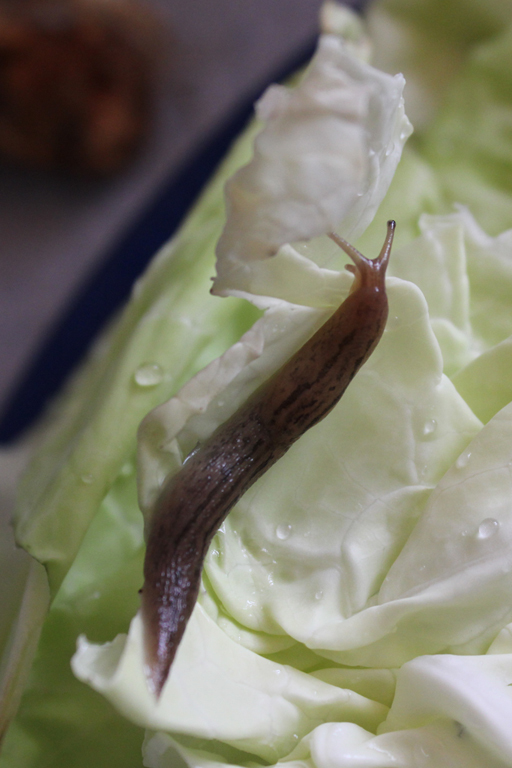 I cut a cabbage the other day for my lunch and found this beastie (actually only about 3 cm long) had taken up residence in the not-quite-outer leaves. I discarded the leaf he inhabited and momentarily mulled over the benefits of pesticides. The creature was contained in an empty butter tub until he could be safely despatched outside. I couldn't bring myself to use my best kitchen knife for that purpose, the memory would have lingered long. I still don't think I'm suffering as badly as others but have noticed that sunflower and cabbage leaves several feet off the ground have been decimated (probably snails) and the strawberries are more like Swiss cheese unless I get the ones high on the stem. So, what can be done? I've grown all my peas, beans, courgettes and squash in modules and planted them out as small plants. They were given the added protection of a litre-sized plastic bottle as a collar and I've also heard that a good smear of Vaseline around the collar is a barrier that slugs won't cross. The collars were sunk several inches into the ground and seem to have worked although the plants are woefully behind schedule. I've also recently witnessed a friend stomping on a colony of slugs found under a plank in the veg patch; she was venting her rage at the loss of all her beans and seedlings to the slug buffet but the sludge left by their burst bodies was so revolting as to make me feel a bit ill. (And very glad it wasn't on the soles of my shoes.) There's no denying that this is effective. Ultimately though I decided to make a Sluginator - it's a wide-necked bottle of very salty water into which I've been dropping slugs as I come across them. I'm not proud of myself but it works. Luckily for me, I live next to a handy railway line where I can dispose of the corpses. Normally I see two or three slugs in a year. This year they're out in force, slithering across the paths and pavements in groups and in broad daylight. I don't care if they do eat rotting veg, I'd like to see less of them. Not all are harmful to the garden, Defra has a rogues gallery of slugs with info. On the other hand, anyone who feels kindly enough to know more about them should head over to the Higgledy Garden, or Wellywoman's blog, for a good sluggy read. Bugs and slugs are accepted as part and parcel of growing your own veg but, yesterday, as I sat through torrential downpour and with rain forecast for the rest of the week, I'm wondering if anyone else is finding this summer a touch apocryphal? Floods, slugs, snails, blackfly, weeds, no fruit and rotting and/or bolting veg - and, here in London, I've also had fox cubs digging up newly transplanted seedlings and pooing wherever they can get access. I hope the proper summer comes soon because, frankly, I'm finding it hard to muster my usual delight in the garden. Wildflower meadow in a tray on my balcony! Today I was supposed to be at Hampton Court for the flower show. I had my ticket and programme ready and then I overslept. I never oversleep. No, seriously, I'm one of those annoying people that leaps cheerfully out of bed at 6.30 a.m. to embrace the day. Today the fates decided otherwise; between yesterday's extended balcony gardening, repotting and moving plants until beyond nightfall, being kept awake throughout the night by workmen laying gravel on the nearby railway tracks and torrential downpours of rain, I was thoroughly befuddled when I eventually awoke around 9.30! It wasn't too late to go but I just couldn't motivate myself out of my pyjamas. It was pouring with rain and I thought about the joys of standing in a large crowd getting soaked and decided to save myself the two and half hour return journey and do some more planting at home instead. So, to cheer myself up, I thought I'd post about the flowers currently on display in the Veg Patch gardens and have resolved to be a bit more stoic about going next year. I'm sure it will be worth it. Day Lilies about to flower. Potato flower from unknown tuber. White onion. Several appeared this year after an onion was left for seed last year. Oriental Lily - I think this is supposed to be edible but probably a bit chewy. Tom Thumb nasturtium: edible flowers and leaves. Marguerites - so fresh and cheerful. Sage flowers. Edible slightly milder taste than the leaves. Violas, still flowering in mid-summer, probably due to the rain! A corner of my exuberant herb bed: strawberries, lavender, golden oregano. Borage buds. I've sown seeds to flower at different times to keep bringing the bees in. Lavender, nurtured from a tiny wind-sown 2 cm seedling found in the soil last year. Kale flowers, now eaten. Yum! So, less of a veg patch and more of a flower garden on this count! I said last year that I hoped to introduce more flowers into the veg garden; hmm, that seems to be happening okay. And I haven't even mentioned the sunflowers or red orach or any of the other flowering herbs. I promise, there are plenty of veg in here too! PS. As I've typed this post, we've had several heavy showers so I'm now feeling vindicated in my decision (if very wasteful of the ticket. Still good causes and all that ... ). Needless to say, all photos were taken on previous occasions! I'm picking a bowl of raspberries and strawberries every day now but have gone off the taste of the strawbs that I'm growing - more often than not, the flavour is insipid. This is my fourth year of food growing in the veg garden and I've found that if you want to get people interested in food growing it has to taste really good. The strawberries were donated to the Veg Patch as runners so I have no emotional attachment to them (unlike plants that I've grown from seed); think I'll pull them all out and choose a really flavoursome variety for next year. With a couple of years of strawberry growing behind me, I've come to realise the mistakes I've made and will put that knowledge to good use in rethinking my strawberry growing area. First, where to put them: Initially I set the plants out in rows, straight into the ground, in the traditional manner although the space was limited. The area gets around 6 hours of sun or good light in clement weather. They grew well and, in no time, were sending out runners. My careful rows soon disappeared in a mass of plants - a lovely hiding place for slugs! (I almost picked up an e-normous slug the other evening when reaching for a juicy red berry under the leaves.) It's been challenging to get amongst the plants to separate out the runners as the rows were fairly closely planted. I've recently read that chopping off the runners can send the plant's energy back into producing fruit, a tip worth considering if you don't need to increase your plant stock. I've now thinned the patch to two rows, front of border with a foot-sized space between. Second, accessibility: An unforeseen problem I encountered with having a strawberry "patch" was that children would wade in to get at the fruit, regardless of other plants being trampled underfoot. Bending down for an extended picking would also do my back no favours. I've now relocated many of the sturdier plants to a single row at the front edge of a 30 ft long raised brick-walled bed, about 2 ft high and much more attainable. This situation could have been entirely avoided if I wasn't trying to cram too much variety into my tiny space - on an allotment, the rows would (should) be around 30 inches apart, leaving plenty of room for feet both big and small. Third, finding the fruit: The plants are very leafy with the fruit growing underneath and therefore hard to spot. I like to get to the fruit before the slugs (and birds) do so it's important to be able to see them. Children (and I) don't want to eat fruit that has been previously enjoyed by the animal kingdom. Plants bearing fruit on strong upright stems will be among my top choices for replacement plants - and putting a thick layer of straw under the plants also helps. I've been growing a few Rambling Cascade plants (from Victoriana) and they seem to have large fruit on upright stems so that's heading in the right direction. So far I've picked only one or two berries from these plants as they seem to be later in fruiting - the taste is semi-sweet and slightly floral. In fairness, the smaller quantities may be due to being in a slightly more shaded area, although they would, in a normal year, get plenty of sun. As usual, the garden is teaching me a lot this year. I'm amazed at how much I didn't know when I started. I believed it was as easy as it says on the seed packet - a triumph of expectation over experience. This year has, so far, has forced me to learn about bugs, pests, shifting seasons and now soft fruit. With strawberries, the essentials are: Buy good plants to start with, plant with the crown at soil level, give them space to grow, mulch with straw or plant through black plastic (to retain moisture, keep weeds down and slugs at bay), chop the top leaves down after fruiting (except on perpetual fruiting plants) so that the new leaves on the crown can grow and, finally, replace the plants every 3 years to prevent disease or pests getting a hold. I owe my rapid learning curve to the RHS website. Good videos, recommended varieties, top tips and recipes are just a click and a link away.